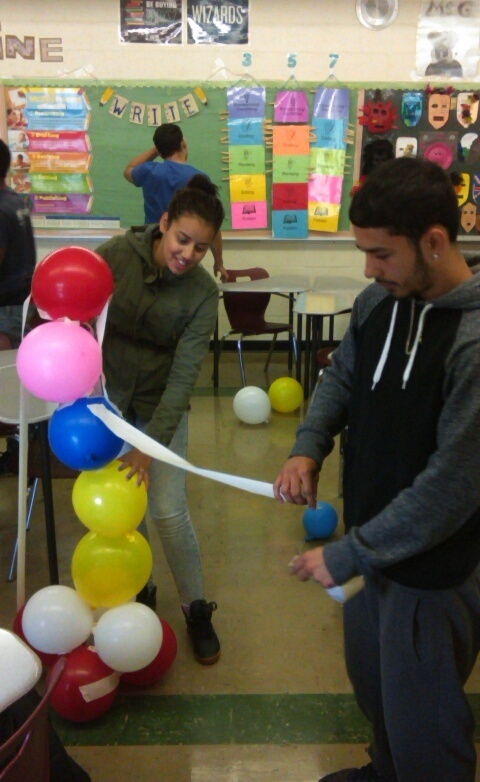 This week my MHS JAG students were hard at work constructing Balloon Towers. For the task, students worked in teams of about six students and were given 24 balloons and a role of masking tape. The only requirements were that teams had to use all of their balloons and the towers had to be be free standing. Activities such as these help to reinforce JAG’s Leadership and Self-Development competencies. The students demonstrated excellent teamwork and the activity also exposed the natural leaders within each group, serving as a prompt for us to discuss the different roles and dynamics found in effective teams. Students have also been busy preparing her students for the upcoming Career Association elections. The Career Association is a student-led club that gives students the opportunity to develop, practice, and refine personal, leadership, and employability skills. Manchester High School JAG’s first guest speaker of the year was Mayor Jay Moran, who answered questions on everything ranging from his sleep schedule, parliamentary procedure, how he balances his two jobs and prioritizing family. MHS’s JAG Specialist Justine Meyer arranged the visit, asking Mayor Moran to speak in particular about how elected bodies make decisions, since JAG students will soon be electing officers to lead them through the JAG Career Association projects that will take place over the year. But the Mayor touched on far more, including the death of his daughter more than 10 years ago, and how that experience has shaped his outlook. Mayor Moran also works as the director of athletics for Southern Connecticut State University. That makes for a very full schedule, and means he sometimes emails his staff at 3 am. “I could never be a 9 to 5 person,” he said. He told students about his own college experience and early career, and advised students to find a mentor, and to look for ways to get along with everyone. MHS’s JAG students had many questions, and also invited Mayor Moran to their upcoming Installation and Initiation Ceremony, which will honor JAG’s elected officers and also all the student members of JAG’c Career Association. The Career Association is led by students and is a core element of JAG. Students will design and carry out community service projects throughout the year to reinforce the leadership and professional skills they are learning in JAG. Pictured above are MHS English teacher Angelina Dale, who will be a member of JAG’s Advisory Committee, at left, with Mayor Moran and Justine Meyer, at right. Patty Damiani’s East Hartford High School JAG classes had a visitor last week: Journal Inquirer reporter Kathleen McWilliams, who wrote a story for Friday’s paper about how JAG came to Connecticut and showcasing some of Damiani’s activities. Creativity is an important part of the JAG Specialists’ job, McWilliams reported. JAG teaches core competencies which have been time-tested and are in demand by employers, she wrote. But Specialists can be creative in how they teach them. 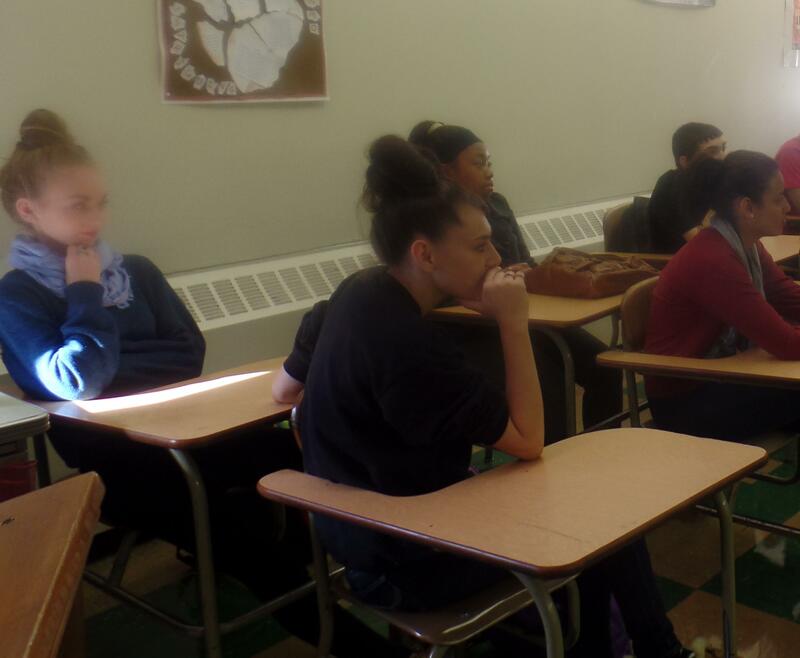 McWilliams observed Damiani leading a class discussion on values, asking them to take a position and then discuss their opinion on provocative questions: Does everyone need a high school diploma? If you see a co-worker stealing from your employer, are you obligated to report it? Damiani also demonstrated the notion of value by taking a $20 bill, writing on it, crumpling it up and stomping on it. Click here for the full Journal Inquirer story.